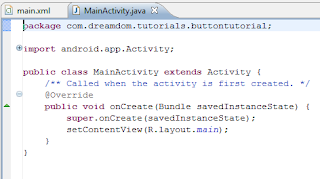 In this tutorial we will create a simple Android App that responds to input from a button. Every time the button is clicked, an onscreen counter will update showing the total number of clicks. Most Android apps involve using buttons to direct actions within the activity. 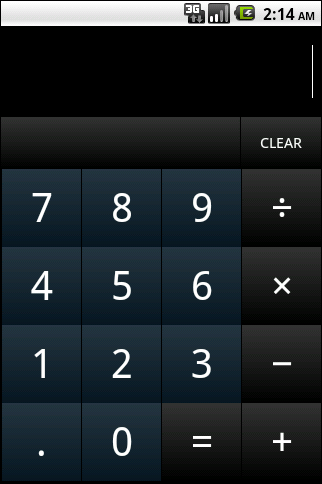 Think about the built in calculator application. It is essentially made up of just a bunch of buttons. They may not look like the standard, buttons, but it is possible to skin Android buttons to look however you want. 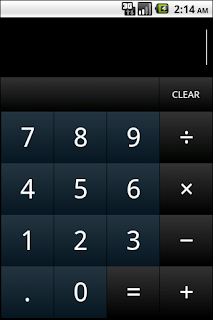 Screenshot of the Android calculator. Start a new android project. Call the project "Button Tutorial" and set the package name to "example." Check the "Create Activity" checkbox in the wizard and set the activity name to "MainActivity" If you need help see this tutorial for more information on creating a "Hello World" project. For a full tutorial on create layouts, click here for the android layout tutorial. Open up the layout file main.xml. Make sure the following properties are set for the parent linear layout. If there isn't a TextView in the layout already, add one. Set the following properties. Now, add a Button to the layout, and set the following properties. Feel free to adjust the properties as you see fit. Listed below is a screenshot of the layout we have created. Screenshot of the layout created. Make sure to save your layout after you have modified it. When you save the layout, the generated Java class, R, will be recreated to include the ids of any new elements you have added to the layout. 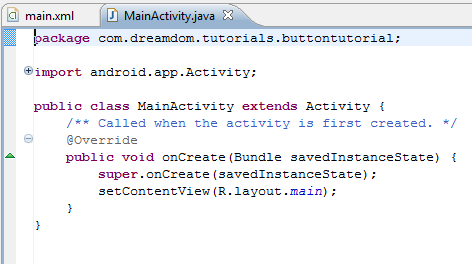 Now that we have created the layout, its time to edit the actual Java code that is the logic behind the program. Open up MainActivity. It is located under src->example->MainActivity.java in the project explorer. Let's examine the code that is already there. MainActivity extends the Activity class. Activities are the main components of Android Applications. The onCreate method gets called when the parts of the activity need to get built. The first line calls the super constructor, and the second line sets the layout of the activity. Now add a member variable that will keep track of the count. The complete code for the activity so far is listed below. The Android Developer Tools make it really easy to reference the components inside of your resources folder. The ADT will automatically generate a Java file, R, that contains unique integer ids for all your resources. These generated IDs can then be used in your Java code to reference the resources. Do not modify the file R.java! 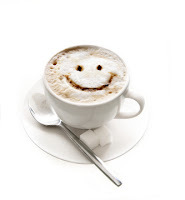 If you modify your project to add a layout or a new drawable the file R.java will automatically get regenerated. On occasion you can run into problems, but these are generally solved by going to Project->Clean to regenerate many of the files. You will need to add the following lines at the top of your project. If you are still getting errors as part of "R.id...." make sure that you have saved the layout after modifying it. Now that we have references to these views we can modify them in all sorts of ways through the Java code. Most of the properties we've set in the layout editor can also be set by using member functions for the views. Now that we have a reference to the count button, we want to add a listener that handles when the count button is clicked. An easy way to do this is to have an anonymous class implement the View.OnClick interface. The Code listed below demonstrates this. Make sure to add the following code to the top of the file. Now we just need to fill in the logic that will increment the count, and update the value of the text view. Add the following code inside of the onClickListener that you just created. Finally, run your project and press the count button. You should see the count on the screen go up. As always, please leave any questions you have in the comments area, and I will be glad to help! Very useful to understand the basics. Thx! Exactly what I was looking for, cheers! Thanks for this tutorial! Exactly what I was looking for, cheers! It helped me a Lot. Thanks a ton man!